Dedicated to the Bellanca Cruisair, Cruisemaster, Viking, American Champion Citabria, Decathlon, Scout, Champion and AviaBellanca Skyrocket lines of aircraft, their furtherance, history, preservation and maintenance. 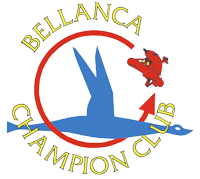 The Bellanca-Champion Club welcomes all owners, pilots and enthusiasts. 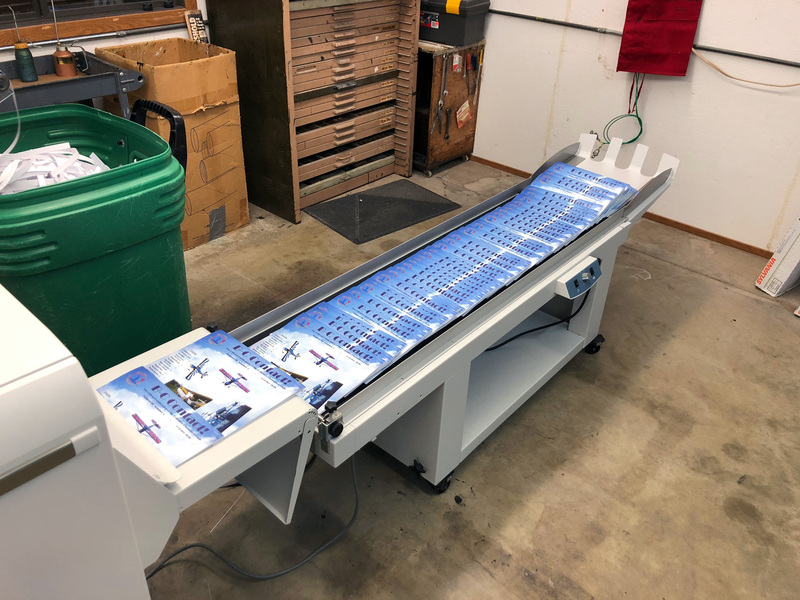 Our Publication Catalog is now available online. 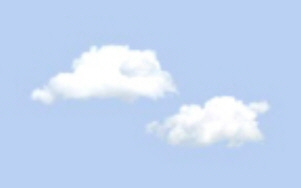 We have received an Airworthiness Concern from the FAA regarding all carburetors. You can read / download it from Here. If you decide to respond, please send a copy of your letter to Us as well. Sun getting in your eyes? Check out our SunShield for the Citabria, Decathlon, Scout and Champ. Updated with new information 4/13/2006. 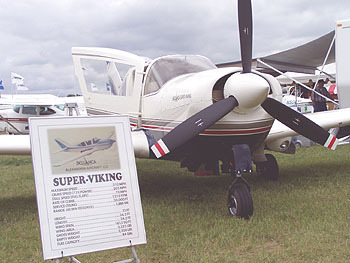 First new Super Viking from Alexandria Aircraft! Seen at AirVenture and Sun 'n Fun 2006! Right: John Morrison and his 260, who won the Outstanding in Type award. AD 2004-05-24 is a "final rule" without NPRM and affects crankshaft gear retaining bolts on some IO-540 engines used by the Viking 17-31A. 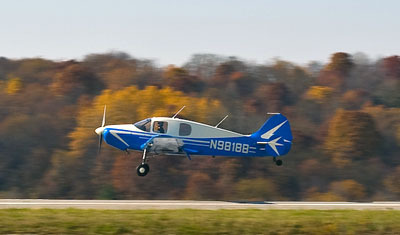 Dale Williams received the Midwest Antique Airplane Club's "Classic Project of the Year" in 2002 for his consummate restoration of his 1947 Cruisair. Scott Thomas (CFII, A&P/IA) was Technical Advisor for the project. 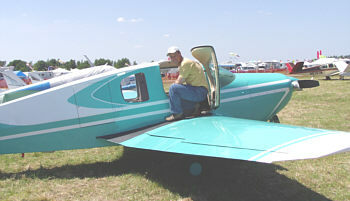 Bill Reeves (a Club volunteer) with his new 260 at Oshkosh. No, he doesn't own the "other" Triple-Tail. See the New Items just arrived in our Gift Shop! 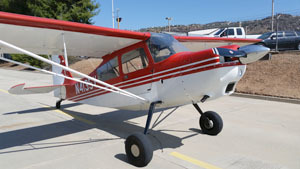 Champion Lancer (Model 402) is the only post-WWII multi-engine airplane produced by either Bellanca or the Aeronca/Champion factories. The article in the October 2003 (13-4) issue of B-C Contact! provides some of the unique aspects and pictures, and prompted a letter from another member (issue 14-1) who had trained in one in the sixties. 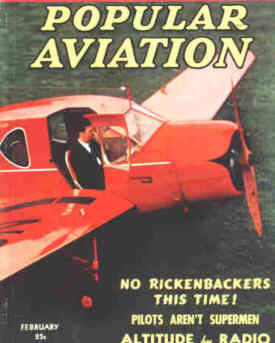 The 1940 issue of Popular Aviation shows the Bellanca (Cruisair) Junior. Unfortunately, no story within. Our Fly Market and Parts Bin can now be viewed on-line. A feature of B-C Contact! 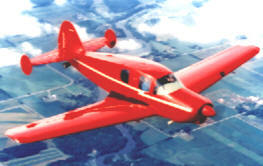 for over 16 years, these classifieds help our members sell and find their planes and parts. Final installment of this travelogue appears in our January 2002 issue of B-C Contact! 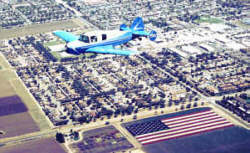 Jan Zatloukal's Cruisemaster was the last 14-19-2 built, shown over the Bodger flower flag in Lompoc, CA. Cmdr. Victor Mottarella, USN, Ret. 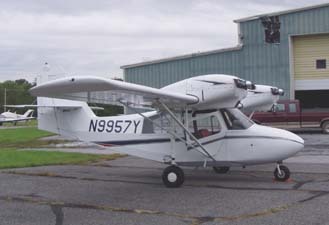 (co-owner at the time with Bruce Fall) flew N9849B for the photo shoot. 'Say Type Aircraft'.. A reference to the type designators that will identify your aircraft and its performance to the controller. * This is a reference to an ill-fated 1938 non-stop flight from Spain to Cuba. ...with his new Vortex Generators installed. 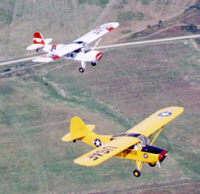 We received this from the F.A.I., the international organization that verifies and awards official aviation world records:You may be interested to know that we have a number of Bellanca aircraft world records in our lists of world-class performances... A Skyrocket II still holds the 'speed over a closed circuit course of 100 / 500 / 1000 km' records in the concerned weight sub-class. 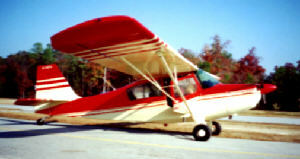 <- Aeronca Champ 7AC - low and slow..